Another two weeks have passed in Azeroth, which means another two weekly special event quests com­pleted. 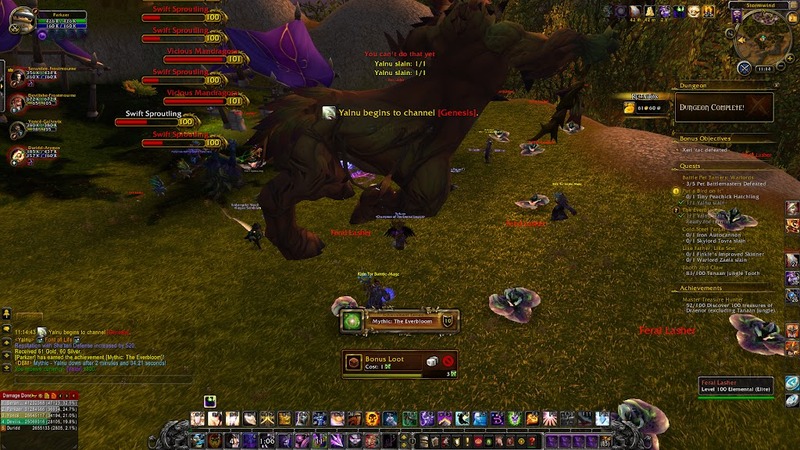 Last week’s event was Emissary of War, which involved completing four mythic dungeons. The last time this event came around, it was very difficult to find a group with which to run the dungeon because my guild is inactive and I had a pretty low item level. If you’re not familiar with the recruitment interface, it shows the party leader a list of applicants sorted by their item level, so because mine was around 700, nobody wanted me. This time, because I upgraded my gear quite a bit since then, it was easy for me to find groups. I also wanted to continue upgrading gear with mythic dungeon drops, so I ended up doing more than I needed. 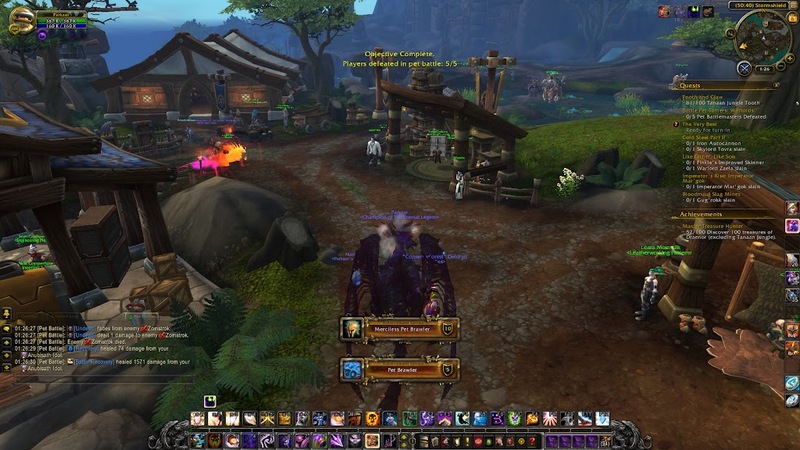 Out of the ones I completed, three of them were for the first time – Grimrail Depot, Upper Blackrock Spire, and the Everbloom. 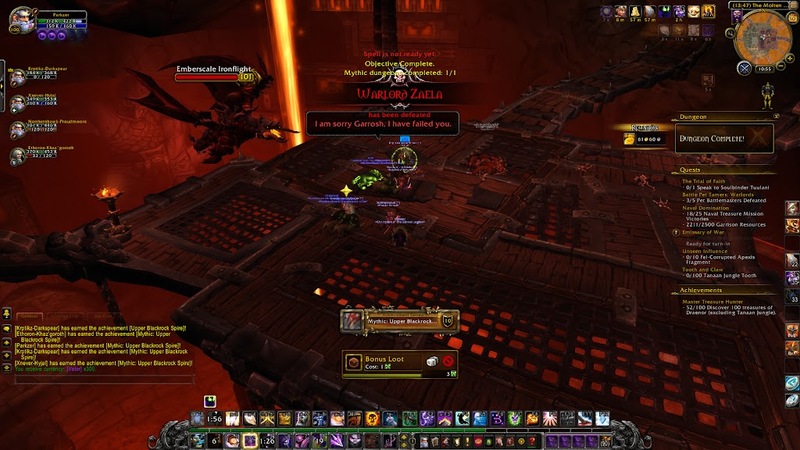 The last time I had to do four mythic dungeons, it was pretty difficult because not everyone in the group knew what they were doing. 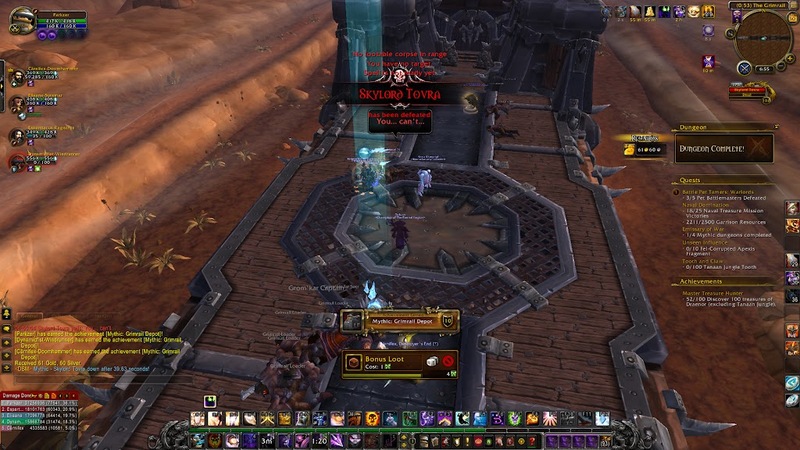 If I remember correctly, I think there might’ve actually even been one instance where everyone else gave up and quit, and I had no other choice but to leave because nobody ever joins a group through the custom group finder with only one DPS player sitting inside it. This time, it seemed marginally easier, possibly because everyone’s item levels are slowly going up due to the fact that they’ve had a longer time to play, and any errors they might make during the boss fights become less punishing. This week’s event was pet battling. I have a full team of tanky, area-of-effect pets that do decently well against any composition, so I ended up defeating five opponents and finishing the quest pretty easily. I only suffered two losses – the first because the opponent both had a better composition than me and outplayed me, and the second because I was the unluckiest person alive and missed three attacks in a row with a 90% hit chance. While I was in the spirit of pet battling, I also got my Overstuffed achievement, which you earn by leveling an Elekk Plushie to 25. The tricky part about this is that the Elekk Plushie can’t actually battle. All of its moves do nothing, so you can’t train it without swapping out to another pet and having them win instead. Fortunately, I’m decently wealthy (not in the sense that I have piles of gold, but in the sense that I already have everything that I want and need, so I can spend gold at my leisure on whatever comes up). 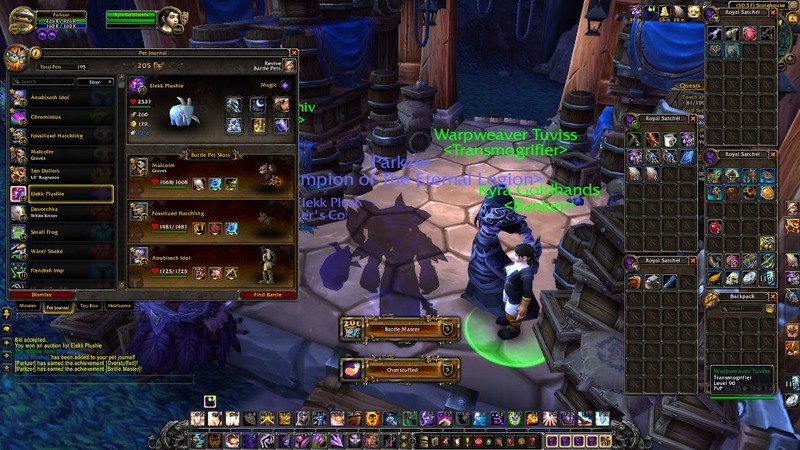 I went on the auction house and found a level 24 rare Elekk Plushie, most likely designed that way specifically to sell to someone who wanted the Overstuffed achievement. I bought it for a few thousand gold, and finished the last level with a stone. I was planning on naming my Elekk Plushie “Mammoth” and using it as my companion pet, but apparently, it doesn’t actually move either. When you put it down, it stays in the same spot, and when you walk too far away, it just despawns.